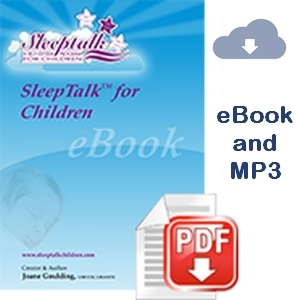 This third edition of the SleepTalk® process is now available. 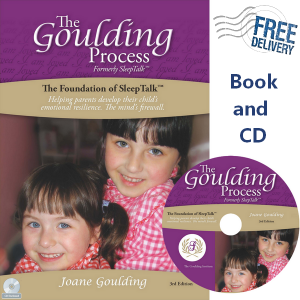 The Goulding Process (formally called SleepTalk® for Children) was developed in the 1970s, empowers parents to improve and balance their child’s behaviour. It’s easy to learn, and takes parents only two minutes at bedtime, and it cannot be done wrong. It’s absolutely safe, ethical and positive. It is also quick to implement. 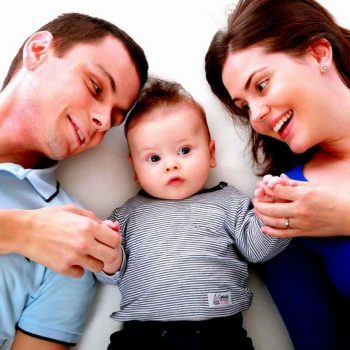 Parents and health care professionals have called the Process a powerful self-help program which parents and childcare professionals have been using for more than 35 years. They endorse it because it WORKS, helping to reduce anxiety and stress, developing a positive self-confidence, empowering children to manage, improve and balance their behaviour, anxiety and relationships. When you buy the paperback book and audio you will also receive a link to download a bonus MP4 video: Developing a Child’s Emotional Resilience: The Mind’s Firewall when Joane Goulding discusses how the SleepTalk® process works to balance children’s anxiety, stress, and relationships, and demonstrates the positive down line ramifications of change and calmness that SleepTalk® creates which permeates throughout the entire family. This video on DVD normally sells for $40. 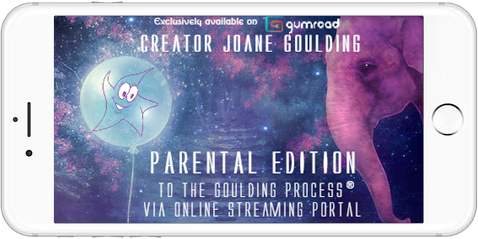 The other bonus Mp4 video, Developing The Goulding Process: The Michelle Story describes the case history that led to the development of the process. SleepTalk® products give directions for the Foundation stage of the process. If you go through the Foundation stage and feel that you need to address some specific issues with your child, then we would recommend to speak to an Accredited SleepTalk® Consultant in more detail and revise the process with an adjusted statement to address the issue. And for the investment of less than one session of therapy, or one psychological consultation in most countries around the world, I would be happy to offer you the ebook which you can download immediately and start working with this evening. In addition to that, just so that you can get to absorb the lessons effectively – I will include an MP3 recording, detailing the background and the information to give you the tools to implement this amazing simple process. This MP3 is normally valued at $20. And just in case you need further support, when you confirm your purchase, I will also send you a link to a register of SleepTalk® practitioners all over the world, who you can consult if you need any support to carry through the process. This is a priceless resource of trusted colleagues who can support your family’s transition into healthy and happy relationships. Note: Items are shipped using Australia Post’s standard service. We can not accept responsibility for non-delivery or extra costs to ship replacement items. If you believe your shipping destination may have difficulties, I recommend paying for Registered Post – cost varies. Please include this request when making your order.